U.N. Human Rights Chief: Aung San Suu Kyi Could Be Culpable For Genocide : The Two-Way Amid her country's brutal treatment of the Rohingya, Myanmar civilian leader Suu Kyi's once-saintlike reputation has taken a steep dive. 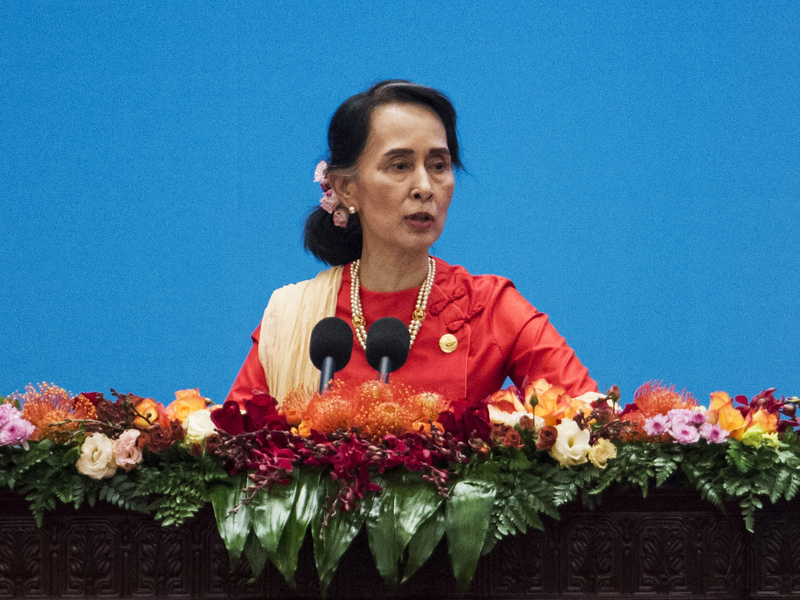 Myanmar's civilian leader Aung San Suu Kyi gives a speech this month in Beijing. The U.N. human rights chief says she could be held responsible for her country's brutal treatment of the Rohingya. Myanmar's civilian leader Aung San Suu Kyi and head of the armed forces Gen. Aung Min Hlaing could potentially face genocide charges in the future, said the United Nations human rights chief. "Given the scale of the military operation, clearly these would have to be decisions taken at a high enough level," High Commissioner for Human Rights Zeid Ra'ad Al Hussein told the BBC. "And then there's the crime of omission. That if it came to your knowledge that this was being committed, and you did nothing to stop it, then you could be culpable as well for that." In September, Zeid called the treatment of the Rohingya in Myanmar "a textbook example of ethnic cleansing." He said the situation could not yet be properly assessed because Myanmar had denied human rights investigators access. Whether genocide has been committed would eventually be determined by a court, not Zeid. And the commissioner told the broadcaster that it would be a difficult case: "For obvious reasons, if you're planning to commit genocide you don't commit it to paper and you don't provide instructions." "The thresholds for proof are high," he continued. "But it wouldn't surprise me in the future if a court were to make such a finding on the basis of what we see." It is hard to think of a sharper fall from grace than Aung San Suu Kyi's, who won the Nobel Peace Prize in 1991 and was under house arrest for nearly 15 years. "Inspired by Mahatma Gandhi, she opposed all use of violence and called on the military leaders to hand over power to a civilian government," the Nobel Prize official site noted. "The aim was to establish a democratic society in which the country's ethnic groups could cooperate in harmony." Just last year, Myanmar elected Suu Kyi's party to power, after decades of military rule. She is barred from the presidency because her sons are foreign citizens, but she is seen as the country's de facto leader. She does not control the military, though, which as the Economist has reported, "controls the home, defence and border-affairs ministries, as well as the country's security forces and civil service." Still, the U.N. human rights chief is frustrated by a lack of action from Suu Kyi. Zeid told the BBC that he called her in February and urged her to protect the Rohingya. "I appealed to her to bring these military operations to an end," he told the broadcaster. "I appealed to her emotional standing... to do whatever she could to bring this to a close, and to my great regret it did not seem to happen." He also criticized Suu Kyi for not using the term "Rohingya." Suu Kyi has also been criticized by other Nobel laureates, including Malala Yousafzai. "Over the last several years, I have repeatedly condemned this tragic and shameful treatment," Malala wrote on Twitter. "I am still waiting for my fellow Nobel Laureate Aung San Suu Kyi to do the same. The world is waiting and the Rohingya Muslims are waiting." The U.N. says that more than 600,000 Rohingya have been driven out of Myanmar since August. Last month, U.S. Secretary of State Rex Tillerson labeled the "horrendous atrocities" in Myanmar as ethnic cleansing, and said the U.S. would pursue targeted sanctions. Suu Kyi has rarely addressed the Rohingya subject directly. The New York Times reports that she has upheld the military's stance: that the Rohingya are illegally squatting in Myanmar. "No, it's not ethnic cleansing," she said in a 2013 interview, according to the Times. Though it remains unclear how much power she has to stop the violence being carried out by the military, security forces and vigilantes, many in the international community are stunned by her apparent silence. Former U.N. Secretary General Kofi Annan told the Times, "We created a saint and the saint has become a politician, and we don't like that."